Editor’s note: While The Grapevine Café wasn’t damaged during the Feb. 7 tornado that hit Donaldsonville, the restaurant was without power and temporarily closed, according to a post on its Facebook page that day. Please check with the restaurant before making plans! I used to visit nearby Donaldsonville often for an old job. I’d bring a colleague, and The Grapevine Café was always tops on our list for a great lunch stop. It’s been years since that job and since my last visit, but I often think fondly about The Grapevine and was pleased recently when friends were up for a jaunt out of town. Located in downtown Donaldsonville, The Grapevine is on a picturesque street that could substitute for vintage Main Street USA. The storefront has broad windows covered by an overhang perfectly positioned to shade outdoor tables from the sun. Inside, the restaurant’s tile floors, brick walls and wood accents remind one of a bygone era. 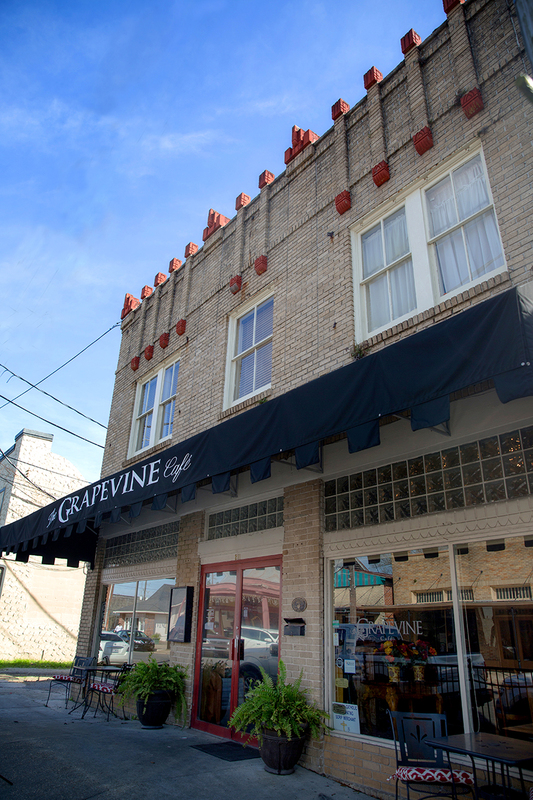 The Grapevine Café is nestled in the quaint downtown Donaldsonville. Knowing that on Sundays they serve both a brunch and their regular menu, we went during typical brunch hours. We arrived shortly before 1:30 p.m., and the joint was jumping. Almost every table was full, many with large parties that appeared to be family gatherings. Once seated, we needed some time to peruse the extensive menu. We chose our appetizers based on the ingredients in our entrees so as not to get repeats. 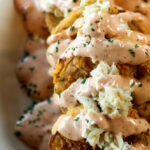 Our lead appetizer of Fried Green Tomatoes was topped with remoulade that had plenty of zing and copious crab beneath. The tomato was moist and juicy with a perfectly crisp batter. It was an outstanding dish. The grilled Crab Cakes were festooned with a roasted garlic aioli and crabmeat au gratin. The au gratin was quite peppery and rich. Half the table found the cake bready and lacking flavor. The other half devoured it happily with no complaints. For a soup, my friend ordered the Hen and Andouille Gumbo. It was a brimming cup chock full of chunks of chicken and large slices of sausage. He commented that the roux was just right and the flavor not too spicy. The rice, served on the side, allowed more gumbo per serving. I will forever be befuddled by potato salad served with gumbo, but apparently it’s a thing here. It just isn’t my thing. The entree choices leaned heavily toward seafood, which suited us all just fine. 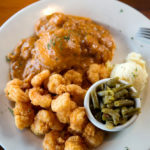 The Shrimp Half and Half had half etouffee and half fried shrimp with both rice and potato salad. 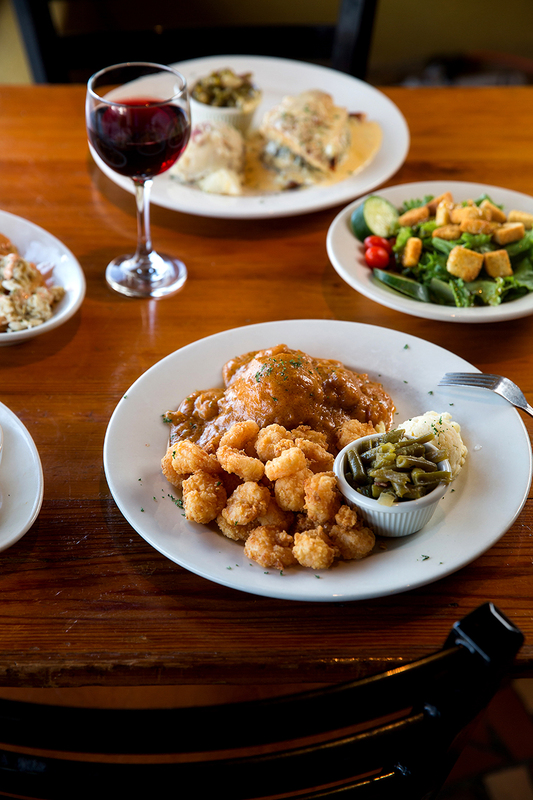 The etouffee was mild and sweet, while the fried shrimp burst with briny flavor, pepper and an amazing crust. The Andouille and Spinach Stuffed Redfish was presented with the stuffing sandwiched between two fish fillets. The creamy lemon sauce worked well with the phenomenally spiced and earthy stuffing. The sautéed spinach flavor shone through even amongst the bold flavors of lemon and smoky andouille. The smashed potatoes side had wonderful texture and a hint of heat. The Crab Stuffed Redfish was topped with crab au gratin. It was more or less our crab cake appetizer but with redfish. Tasty, but the same. The Grapevine’s homemade desserts were highly recommended, so we ordered Lemon Ice Box Pie and White Chocolate Bread Pudding. The pie was mildly sweet with plenty of tart bite. The graham-cracker crust was slightly crunchy and held together nicely without any of that buttery greasiness that sometimes plagues cold pie. The bread pudding, labeled “award-winning,” was dense, rich and oh-so sweet. The center was moist yet firm, with a slight egginess. The pool of white chocolate sauce was an excellent accompaniment. We all concurred with this assessment and vowed to make the trek out to Donaldsonville again soon. 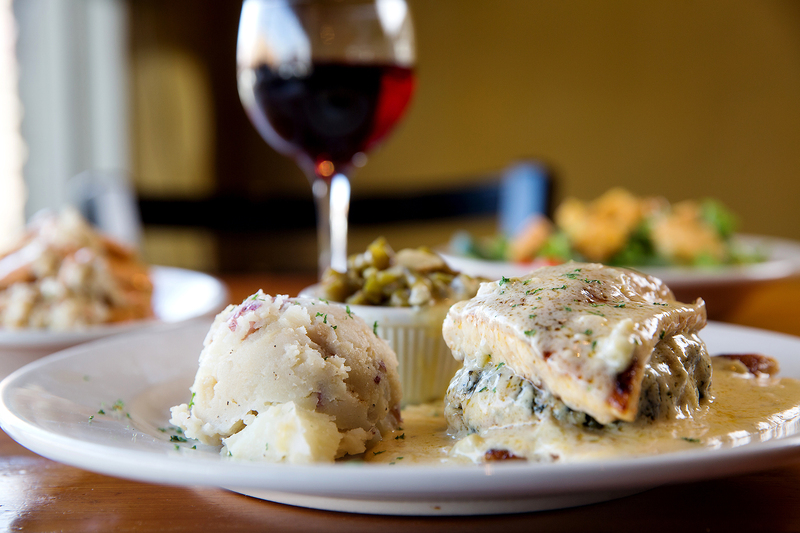 So the next time the question, “Where should we eat tonight?” comes up, the answer just might be a short road trip to The Grapevine. The basics: Each February, we highlight a restaurant outside the city limits for a romantic dinner or just a weekend getaway. Inside a restored 1920s building, The Grapevine Café has been a destination restaurant for many years. What’s a must? The Fried Green Tomatoes with crabmeat and a crisp batter, the Andouille and Spinach Stuffed Redfish with its creamy lemon sauce and the decadent White Chocolate Bread Pudding. 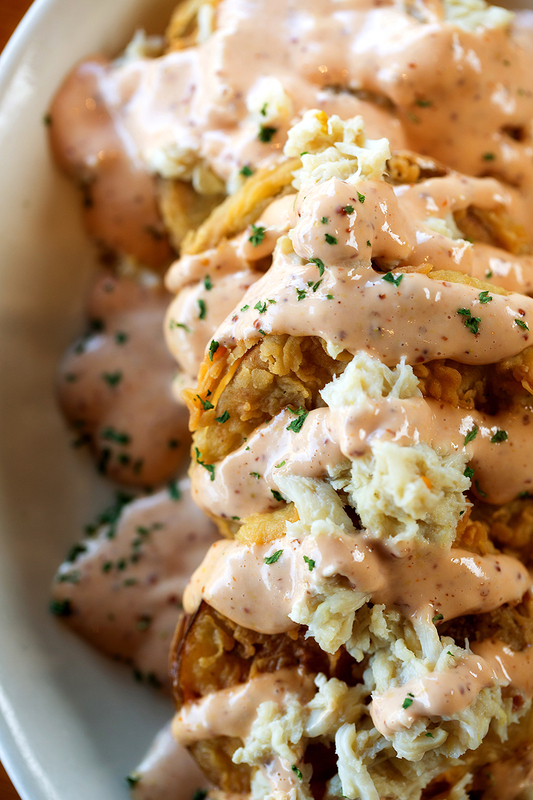 Perfectly crisp Fried Green Tomatoes are topped with remoulade and crabmeat. 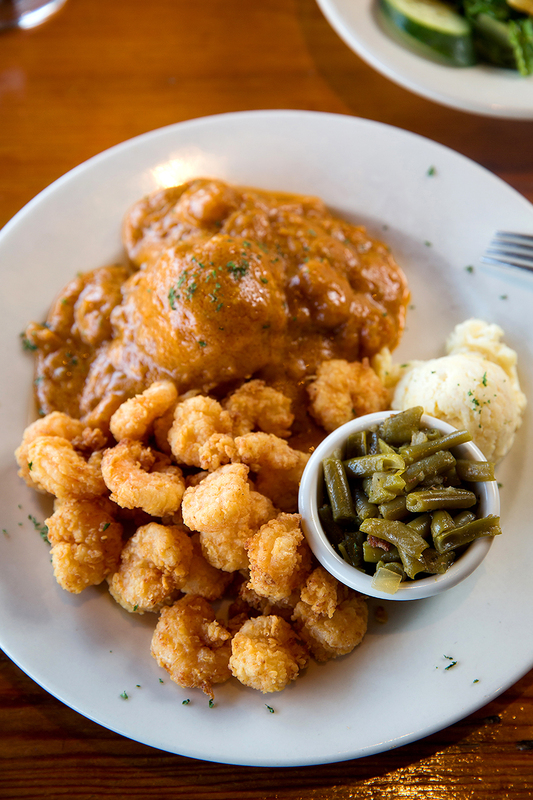 The Shrimp Half and Half is a hefty plate of a mild and sweet etouffee and fried shrimp bursting with briny flavor. 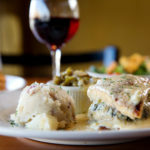 Andouille and Spinach Stuffed Redfish features two fish fillets sandwiching a spicy stuffing all drenched in a creamy lemon sauce. Tuesday-Thursday, 11 a.m.-2 p.m. and 5-8:30 p.m.
Friday, 11 a.m.-2 p.m. and 5-9 p.m.
Sunday brunch and lunch, 11 a.m.-2 p.m. This article was originally published in the February 2017 issue of 225 Magazine.